Powers/Abilities: Intelligencia has brilliant powers of deduction and possesses an intellect that probably surpasses our imagination. While physically vulnerable (just a big head) Intelligencia most likely has psionic powers. She can deduct the exact probability of an event taking place, so she must be able to predict almost all possibilities simultaneously. Also, Intelligencia has the entire Skrull army at her command. Basically, she is just reeaaaalllly smart. (Captain Marvel V#8)- Super-Skrull calls into Intelligencia, who had sent him on a mission to capture Kelly. Intelligencia tells him he can try to subdue her, but he will fail. When hesitating at the chance to kill Kelly, Intelligencia reprimands him. (Captain Marvel V#9)- Intelligencia forbids Super-Skrull to offer Kelly any position in the Skrull army, after he suggested she could be valuable. Intelligencia is peeved at Super-Skrull for disobeying orders earlier (He takes Kelly to Intelligencia instead of killing her and also shows contempt for Intelligencia). (Captain Marvel V#10)- Super-Skrull expresses contempt for Intelligencia, for being insecure in her own fortress at Kelly's power. 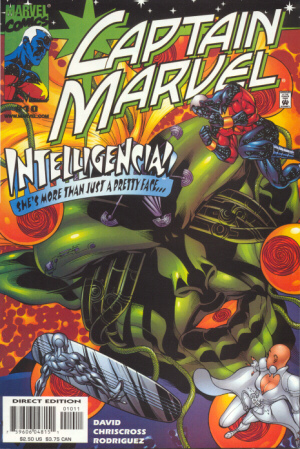 Intelligencia cuts in and orders Kelly and Super-Skrull brought before her. Intelligencia then exchanges words with Kelly, while Captain Marvel, Surfer, and Moondragon fight Skrulls outside. Intelligencia says she is equipped to be immune to her powers and she knew the Super-Skrull would probably betray her. When the heroes demand Kelly back, Intelligencia says that if Kelly goes, the universe will always be in danger. Eventually Kelly goes to another reality where she never got her powers. ...or time is rewritten/reversed, so that she never got her powers on Earth-616. I think she's still on Earth-616--Snood. ��� I'm going to disagree on this. Is she original? No. However, it is very common practice for armies and warring nations to try to duplicate their foes' greatest weapon. The Skrull's had created a cosmic cube, which became the Shaper of Worlds, but they have no ability to control the Shaper, and so they needed something else. Plus, given Peter David's style, the whole thing was likely done tongue-in-cheek. And I loved the story. ��� I'd personally like to know the fate of S'Byll, because she was the last ruler we had seen before this story. Hey, I loved the story too, Snood. I loved most of the Captain Marvel series. I just didn't like Intelligencia.